I’ve done a bit of re-creating today because I wore this outfit on Wednesday for a 40th birthday lunch and didn’t get any photographs. Like today, the sun was shining and it was a day of happiness, excitement and celebration with very special people. The Eliza silk tunic dress from Boden is a little bolder than the dresses I tend to wear normally. It is bright and vibrant, quirky and different. The yellow birds, sunflowers and stylised hydrangeas hold great appeal. And I’m always thrilled when I can accessorise with my sulphur yellow bowling bag (which happens to be exactly the same shade of yellow as the bird on my, erm, chest). It’s a versatile, hardworking sort of dress. 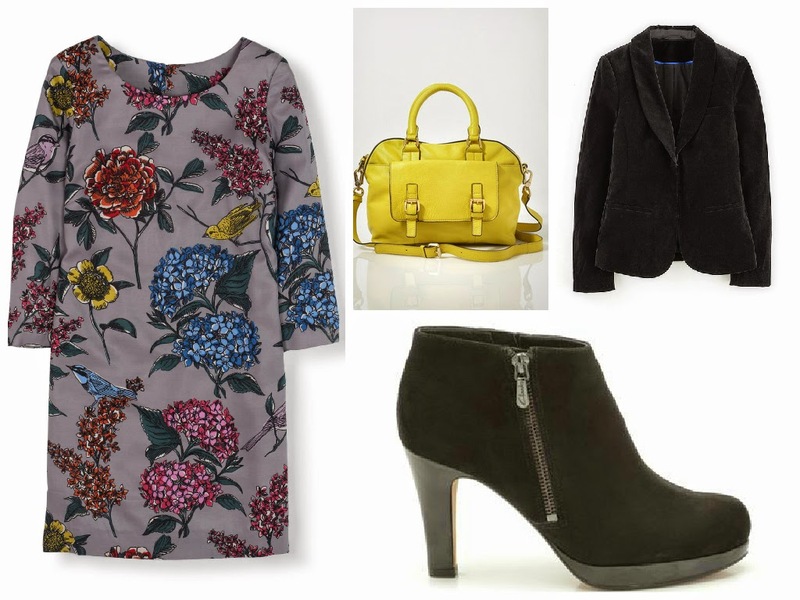 It can be worn with tights and a jacket as I did for a smart casual look or perhaps with sheer tights and court shoes for a more formal look. Dressing it down would be easy too, with a pair of sandals and a denim jacket perhaps. This dress will earn its keep throughout the year. Being a tunic style, it is designed to be worn above the knee. It’s worth noting that this is a (UK) size 10 in the long length. I tried the regular length too and it was, (for someone of my age), inappropriately short. My children would not have let me out. That being said I am almost 5’9″ tall and love high heels. I love this print! I was thinking about buying the skirt, but now I might think about purchasing the dress! Love how you styled it with the pop of yellow in your bag! I love your floral dress, one of my favorite flowers is hydrangea. And the yellow bird is the perfect pairing with the flowers. Beautiful.